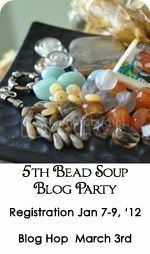 Wild Sally Road: Nancy Dale of NED Beads -- So Awesome! I was talking about not wearing things I make but today I want to show you jewelry that I actually wear. This is my favorite necklace ever. I won a giveaway (lucky me!) 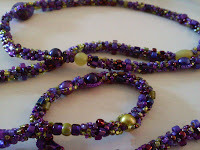 from Nancy Dale of NED Beads. A nicer person you couldn't find! I love her work and am amazed and awed by her use of color and her designs. This is the one I got to pick for myself. Oooh. I love it so much. Even my husband who doesn't comment on the jewelry was impressed w/ her work. I wore it OUT (yes, I actually left my house) and got compliments from complete strangers. I will probably wear this every day forever because I love it that much! Just look at this beauty. I must say my photos don't do it justice. It's actually a richer deeper color of purple and all the other colors just pop off of that. It is yummy! yummy! I can see why you love it. The purples and gold (?) really play nice together. And giveaways just make you feel special anyway! That necklace is stunning??? 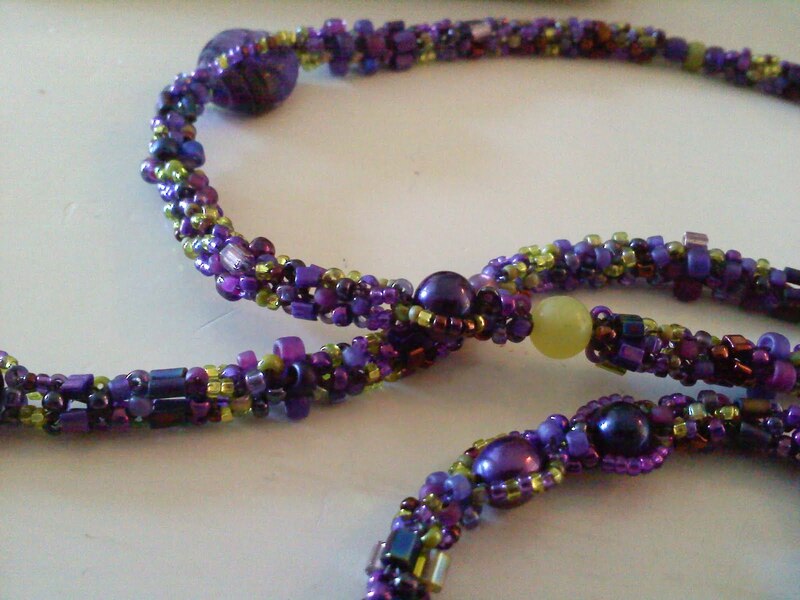 Looks like a combination of stitch segments between strung beads? 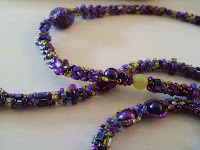 The colors are gorgeous, amazing how simple stitches can pop with the right colors and beads!!! I bet it looks awesome on you! Oh Sally that is gorgeous and she is so sweet too!